This segment is the first of a multi-part post cataloging our adventure as we push our March Madness iPhone app to the top of the store. We’ll show you our revenue, stats, and share our experiences while they’re happening. We’ve even set up a counter website where you can view the app’s free downloads, \$1 upgrades, and conversion rate. So instead of getting important work done, you can stalk the app 24/7 like I do. We’re basically blogging our entire strategy and analyzing it for your entertainment. We’re a small software company (3 part-time dudes) located in Lincoln, NE. That’s right, Nebraska now has software and the electricity to run it (watch out Google!). Our Final Madness app has been released for about a week and it’s been steadily gaining ground since we started our marketing campaign. The guys and I took a bet on how much revenue we thought the app would accumulate. Corey said \$15k, JP said \$1.5k, and I said \$54k. Initially, I was going to do \$15k but it would have been a jerk move to go right above Corey’s estimate, price-is-right-style. Instead, I went balls out to \$54k to make it seem like I had some inside mojo. But honestly, if Final Madness can just break into the top ten list for free sports, we’d all be happy. Not because we’re making money, but because we’re finally starting to make sense of the app store. ​1) Our first order of business was to release a simple and elegant app that would never crash. We adopted the 37signals mantra, “Underdo your competitors.“ I’ve been doing that my whole life, just ask my previous girlfriends. Our mobile developer must have been doing it too, because that is where Corey shined. He built a simple bracket slide interface with live scoring, push notifications, linked stats for every game, and previous years brackets. Everything a basketball fan needs to follow March Madness. The sport with the \$ next to it represents apps that people paid for. The ones without a \$ represent free apps (about 75% of our total). You can see in column O33 that we have about 60,000 customers. 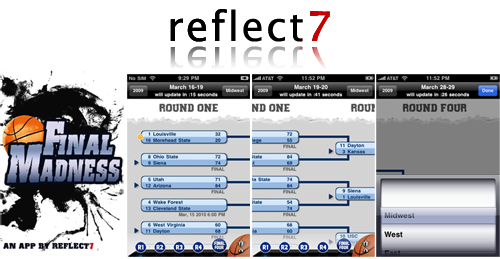 Reflect7 is operating off the assumption that making a top 10 list in any category is a self-feeding process where new views bring in more downloads, which raises your app rank for more views. 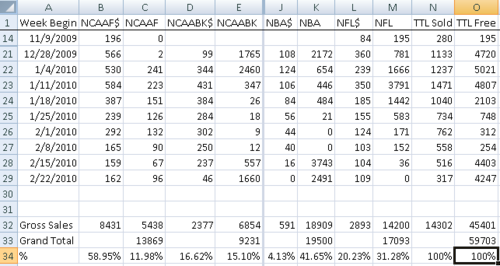 Our goal was to leverage our 60k customer base in a condensed time period leading up to March Madness. If we could convert 33% of our base to Final Madness in a period of 7 days, we’d be looking at 20000 downloads. That’s almost 3000 a day and enough to get us to the top five of the Free Sports list. After that, we’d hopefully sustain a top presence from the list view and March Madness hype. So far we’ve inserted icons in all of our 91 NCAA basketball apps and a handful of our NBA apps. Final Madness had the largest jump in sales after those updates were approved. The conversion strategy seems to be working, but we’ll have more on that next week when I crunch the early numbers. ​3) Our next move was to build a Final Madness website with a Twitter/Facebook promotion. That promotion began today. We’re giving fans a chance to win a 40” Flatscreen when they retweet or update their facebook status with our message. So far, we only have about 5 entries so if you’re reading this, the odds are pretty good. I’ve never done anything like this before so it’s really up in the air. We’re tracking all the links so it will be interesting to see the numbers next week. To supplement the promo, we’ve set up a facebook fan page and decked out our twitter page Final Madness style. Well that’s all for now. If you’re just tuning in we’re sitting at 2033 downloads with 44 \$1 upgrades and it’s Saturday, March 6th at 6am. We still have a few marketing tricks up our sleeve but you’ll have to wait until next week to read about them. With this being a big College Hoops Day, I’m anticipating 1000 downloads. 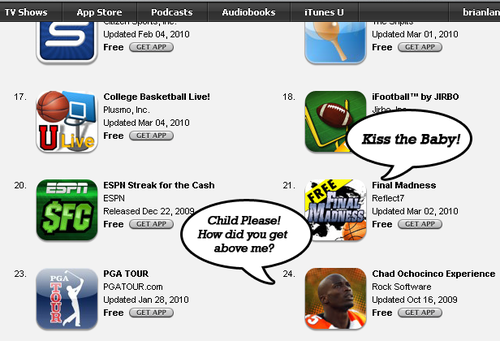 Hopefully, that will push us into the top 10 free sports apps (fingers crossed).